Quotations help us remember the simple yet profound truths that give life perspective and meaning. When it comes to life's most important lessons, we can all use gentle reminders. This is the view of the Nolichucky River from the Appalachian Trail south of Erwin, TN. It's a fairly steep climb to get to to this vantage point, but well worth it. Best to set out on this one in the early morning, rather than the heat of the day! Lots of switchbacks lead you up the mountain and just when you think you've reached the top (or a top) it keeps on going. Your efforts will be rewarded with many different overlooks of the Nolichucky to the east and the city of Erwin to the north. I was surprised by just how beautiful this portion of the trail was -- with your typical rhododendron thickets at the beginning soon giving way to a moss-lined trail with laurels, pines and hemlocks -- and then becoming a mature hardwood forest. It had just rained and the colors of the forest were rich and the fragrant scent of the pines permeated the forest -- making for a beautiful (but strenuous) walk in the woods. Directions: To get there, take I-26 to the Jackson-Love Highway (Exit 40) on the south side of Erwin, TN and turn east toward town. You'll then immediately take the first right onto Temple Hill Road. Travel for 0.8 miles and then turn left onto River Road (also known as Unaka Springs Rd) and travel 0.45 miles until you reach a stop sign. 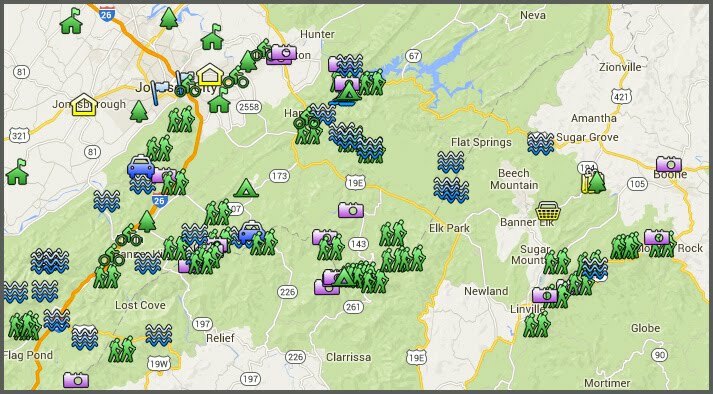 On your right will be Uncle Johnny Hostel, a popular stopping point for AT thru-hikers. The trail crosses through this intersection and goes across the bridge to your left before re-entering the woods. Go straight through this intersection, and immediately park as best you can on right hand side of the road. The AT begins its ascent up the hill just a few steps further on the right. It's about a 1.25 to 1.5 mile hike (one way). 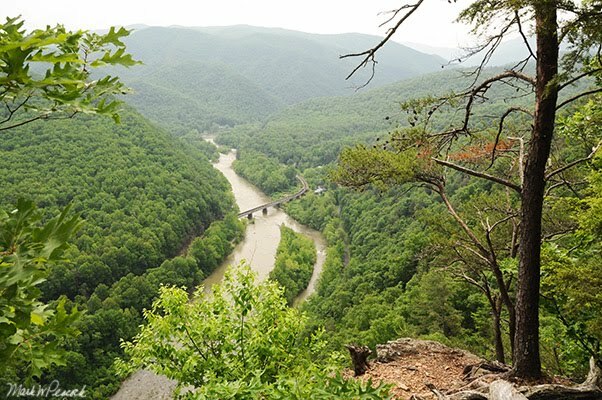 When you first reach an overlook next to the trail giving a nice view of the Nolichucky, venture on another 1/4 mile and you'll come to another, even better overlook.